Far Eastern calligraphy is an art within art, a way of life, and a path to immortality. Just like love fills the heart, calligraphy fills our souls, nourishing a new sense of life born out of selflessness, absence of pride in the fertile soil of a pure mind. It can intrigue you by stimulating the deepest layers of sensitivity accessible to a human being. Life experience adds a lot of flavor to one’s work. In this capacity, it cannot be learned, and it ought to be experienced, it cannot be rushed, but it must be earned. The importance of choosing the ink, whether using a calligraphy brush, calligraphy pen or an everyday fine instrument, is also held in high regard as a critical element in Far Eastern calligraphy and writing. 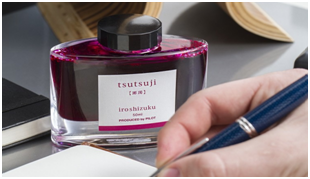 Two of the most popular ink bottle brands that are mainstays in today’s eastern and western cultures are Sailor and Pilot Namiki Iroshizuku, both originating from Japan. You too can embrace the Eastern way of mindful thoughtfulness is by choosing these captivating inks.